It’s whale watching season in New Caledonia right now (mid-July to mid-September). 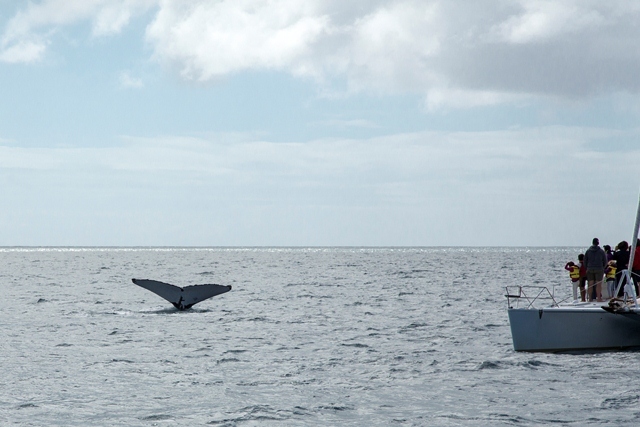 If you’ve never been whale watching, I heartily recommend an outing from Baie de la Somme in Prony (1.5-2 hour drive from Nouméa) or from Nouméa itself, between now and mid-September! We went out this last weekend, and my goodness, to observe these majestic creatures in their natural habitat, is, well – breathtaking. The whales (humpback, that is), take 2-3 months to arrive in New Caledonia from the Antarctic (yes, the Antarctic) and come to reproduce and give birth in our waters. They go 6 months without eating (the time of their migration), as krill (their main food source) exists only in Antarctica. During this time, they lose up to 10 tonnes. But it seems well worth the trip as they return every year and are protected in the Baie de Prony’s nature reserve. The migration of these whales in our waters is closely linked with Kanak culture, since it corresponds to the cycle of yams, a staple food of the Melanesian population. When the Melanesians see the whales arriving, they know it is time to plant their yams. They have known this from the beginning of their culture – the whales have meant the beginning of a cycle, and are revered as so. Whale watching in New Caledonia is practiced by professionals in nautical tourism who are part of a group called the “Caledonia Charter Association”. These professionals have signed a charter of conduct for respect of the animals and their environment. They have also received training to enable them to explain the biology and behavior of the whales, and how and when (and how long) to approach and observe them. 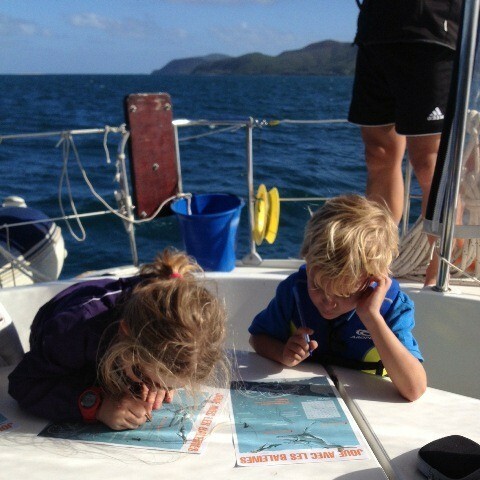 When you go out on one of the 12 catamarans or one of the smaller boats, you will be asked to participate in the observation and identification of the whales (by submitting your photos, helping to scan the horizon to find them, etc.). Strict rules are followed with regard to the number of boats allowed to observe the whales at a time (4) and for a maximum period of 2 hours per animal per day. The boats communicate with each other and take turns, so as not to disturb the mating and nursing whales. When we went out, we were extremely lucky. We spotted several groups of whales – the first, two males and a female (one of the males eventually lost the courtship and left the group). We also saw several different pairs of whales and single whales over the course of 3 hours. It was as if they would come up out of nowhere. A couple of times they swam under the boat and came up on the other side! I was struck by just how close we were, able to observe their coming up to surface, batting the water with their fins, blowing air and of course, showing us their tails. You have to see it to believe it (or refer to the photo above taken by our friend and photographer, Rafael Dubus, on the day). It really is rather incredible – such magnificence, and gentleness, at once. If you’re interested in going out, your best bet is to contact the Maison du Lagon at the Port Moselle to make a reservation. The outing starts at 8am (from Prony) or 6am (from Nouméa). You will be on the water until 16.00. You’ll bring your lunch, your camera, your sunscreen and sunglasses. We paid 8 500 CFP (€71 or AUD 104) per adult for the day, and felt it was worth every franc. We went out on Freya with Captain Didier (and Sebastian) and had a superb day. I would highly recommend checking out his site (in French) and/or contacting him for a day out (or asking for a trip with him at the Maison du Lagon). He truly loves what he does and has a wonderful way of making you love the whales (and the sea) as much as he does. There is nothing better than spending a day with someone so passionate about his work and life. For those of you with children, they’re welcome aboard! Didier occupied the children at the end of the day with “whale school” – where they learned even more about the animals with puzzles and games. I was so taken with his approach and his ease with children that I hope to book him again next year for another whale unit with our son and his friends. We saw blue whales last year on a three-hour tour of the Pacific coast. They came very close to the boat, greeted us. Very cool. Your pix are lovely. Yes, and they splashed their fin in greeting, leaving their giant “footprint”. The intelligence of animals is something that’s struck me anew since I’ve begun to reexplore nature with my boy. It is an unbelievable experience. I went whale watching near Boston and Maui and loved it.